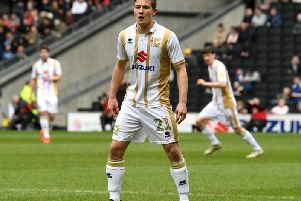 Pete Winkelman admitted he couldn't see Dan Micciche leading MK Dons next season, prompting the decision to part company with his manager on Sunday. The chairman now embarks on his third managerial search in 18 months, after sacking Karl Robinson and Robbie Neilson before Micciche was jettisoned after losing 4-0 to Southend on Saturday. Micciche's record of three wins and three draws in 15 league games mean Dons are six points from safety with three games remaining, and though not mathematically relegated yet, it was enough for the chairman to pull the plug. "I think I had made the decision that Dan wouldn't be the man to take us into next season, and the minute I made that decision, it changed things," said Winkelman. "Him leaving at this point gives us a chance to think about the future. I've got Keith taking over, and that's the best shot of giving us every last chance of doing something this season. READ MORE: Where did it go wrong for Dan Micciche? "I took a risk, it was a gamble, I thought it was a good gamble and there was a period a few weeks ago when I thought it was going to pay off. It wasn't his lack of experience - it was either going to happen or it wasn't. At the end of the day, we could have made a different decision and with hindsight, I would have made a different decision. These things happen in football. "At the time there wasn't someone who jumped out at me. i did talk to others, I didn't just talk to Dan, he had a plan and I liked it. I have huge respect for him, it's one of the most difficult things I've had to do but whatever my relationship with people, it was a decision for the club and that's the responsibility I have. "I really hoped it would be Dan because I believed in him, but just because I believed in him, doesn't mean it translated onto the pitch. "People play differently in successful teams, but playing in losing teams, some can't handle it. That's where you look at your management team to lead and after Saturday, I didn't feel we could go into next year. That's why we've made the decision with three games to go."